It was a lovely calm evening, some cloud but with big gaps, plenty of light left and so at 1700hrs I set off from Kemeys Commander in “red sparrow” for a local flight. Once in the air I could see the weather was better towards the estuary and Cardiff and so I ventured off in that direction keeping an eye on the cloud behind me incase it started lowering intot eh Usk valley. I flew down to Newport and enjoyed the Newport Transporter Bridge from the air. The Newport Transporter Bridge is a crossing of the River Usk in Newport, South Wales in the United Kingdom. It is a Grade I listed structure. Designed by French engineer Ferdinand Arnodin, it was built in 1906 and opened by Godfrey Charles Morgan, 1st Viscount Tredegar on 12 September 1906. The span is an example of the very rare transporter bridge concept, of which only eight exist worldwide. 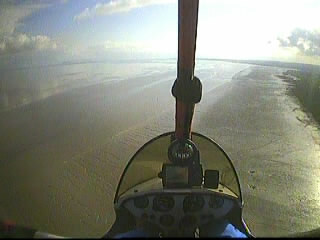 Then I turned West along the Severn Estuary coastline flying low along the beach as tide was fairly low at this time. Soon I was approaching the Eastern suburbs of Cardiff City and called Cardiff Approach for a lower airspace radar “basic service”. I intended to fly over Cardiff Bay which is beneath the outer area of their airspace, however just beyond Cardiff Bay at Penarth Head their control zone starts from the ground upwards. Flying close to the edge of a zone can worry controllers, they dont know if you will fly straight in so unless you have spoken with them they have to start vectoring the jets away from the edge in case you do !! I love talking to them, it’s nice to share a controller with the big jets and the police and ambulance helicopters etc. The conversation went something like this. You can hear some of the controller on the video to follow, but I didnt have the radio patched in when I first called. Cardiff Radar: ”Easy 20 Alpha, Descend now to Altitude 4000 ft, turn heading 030 to intercept the localiser, report established”………. and I continued towards Cardiff. 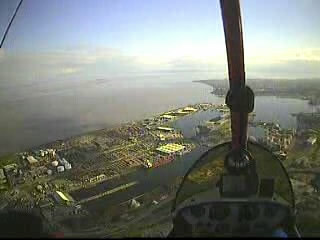 I flew inland slightly and over the docks behind the heliport, over the Atlantic Wharf and the leisure village, over the Cardiff bay hotel and into the Bay. The view is stunning now the barrage is complete and the bay is permanantly flooded. Looking over the docks, the bay ahead and the barrage hidden behind the front strut! I then continued briefly inland flying over Cardiffs civic centre admiring the old buildings of the Law Courts, the University, City Hall and the Welsh Assembly building with Cardiff Castle beneath me as I turned East to head back along the coast. 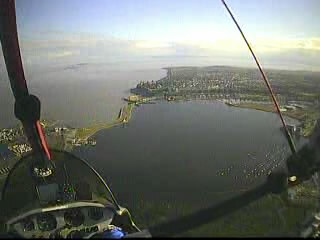 Soon I was skimming along over the beach again to Newport and heading inland up the Usk valley. The cloud was thicker in the valley and as I approached Kemeys Commander the sky gods had the audacity to rain on me so I decided to continue past the airfield for a while and did a circuit around Raglan Castle while the rain shower moved on. Finally I returned to Kemeys from the North and it was now bathed in sunshine again as I descended into a right hand circuit on to runway 13. 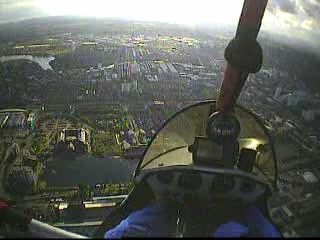 A lovely evening flight of 1hr 45 mins, time to head home via the chippy ! The photos are screen grabs from a head camera video, sorry they are not great, I had the camera on low res. All the pics can be seen in the Photo Gallery along with many from previous flights. 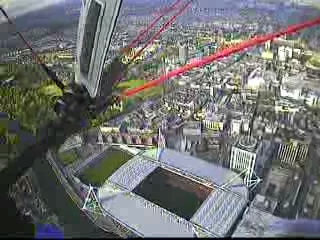 Wow these are some awesome photos of your fly over Cardiff. Too bad I can’t see that view from my flight to Cardiff on regular airlines. Thanks for your comment. I’m glad you enjoyed them. The snaps are screen grabs from a head camera video I took. I had also inadvertently got it set at a lower resolution than normal, hence the small and somewhat poor quality pics. I have recently aquired a full HD 1080 head camera, so check back to the video page for some really high quality videos soon.